Museums play a key role in the creation and representation of the shared cultural heritage of different communities. They have become social nodes that encourage peaceful relationships between people and the improvement of society, addressing traumatic histories through mediation and multiple points of view. The discovery of divisive histories and the ability to express what cannot be said are duties that museums must carry out as active co-shapers of society. They can help reach peaceful solutions to traumatic events from the past and foster an understanding of history that encompasses many points of view by sharing knowledge. ICOM Slovenia, the Slovene Museum Association, the Faculty of Arts of the University of Ljubljana (Department of Sociology) and the National Museum of Contemporary History are organizing an international conference aimed at answering questions about the understanding of hidden histories and the interpretation of cultural heritage today. We are interested in the ways in which collective memories that do not correspond to the dominant historical narratives interact (or do not interact) with the national narrative and how this is reflected in museum exhibitions. What stories are overlooked in museums? How is undesirable and neglected history structured in individual historical periods? What forms and what dismantles public consensus about which heritage should be preserved and in what cases does it become unwanted or even denounced? How does collective memory work and where does forgetting come into play? What limits the freedom of museums and what are the roles of NGOs? What creates consensus and who dictates the interpretation of the past – the professional sphere or politics? Tackling with this questions, the conference provides us with a better understanding of the role of museums as tools for creating peaceful communities and an overview of such implementations in different national environments. 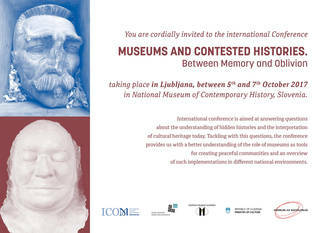 − Elma Hašimbegović (Museum of history of Bosnia and Herzegovina), What happens when once shared heritage becomes unwanted? The character of war heritage is, just like wars are, ambiguous and thus it provokes manifold emotions and interpretations. Is it possible that anything positive and encouraging comes from a total destruction of human bodies and souls, of the landscape and environment? Are we able to find a trace of humanity in the most inhuman conditions of war?